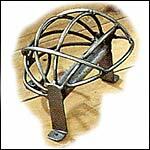 In this section we carry SCA Shield Basket and Sword Basket for your Medieval or SCA event. SCA type Sword Basket Hilt used to protect your sword hand. Includes a clamp and bolts to attach to your rattan sword. 1/4'' thick bars.